Web 2.0 has brought the web many fine features, but none may be more entertaining than user reviews. Take, for example, these reviews on Amazon.com for 2 Playmobil products; Playmobil Security Check and Playmobil Police Checkpoint. 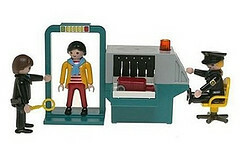 Here is one of the more popular comments for the Playmobil Security Check. I was pretty pumped to get this model. After my Leviathan teddy-bear burst at the seams and my Guantanamo slip and slide tore into several pieces, I was looking for a petty distraction as durable as state tyranny itself. 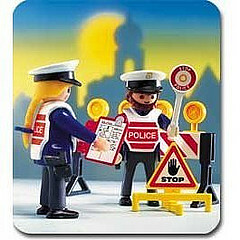 Finally, I found the Playmobil Police Checkpoint. It’s everything a colorful plastic method of indoctrination should be: mobile, plastic, and filled with red warning signs. I love setting it up outside my house. That way I feel like I have to show papers to get in. I know I own it, but it’s cooler if the state lets me in. They know best. Oh, how I do love user generated comment. Read plenty more over at Amazon. This entry was posted in Silly and Fun, Uncategorized and tagged playmobil, toys. Bookmark the permalink. Those are some really funny reviewer comments. Does the security checkpoint set come with 100 lego characters to line up in front of you, or is that the 'I missed my flight' expansion pack?